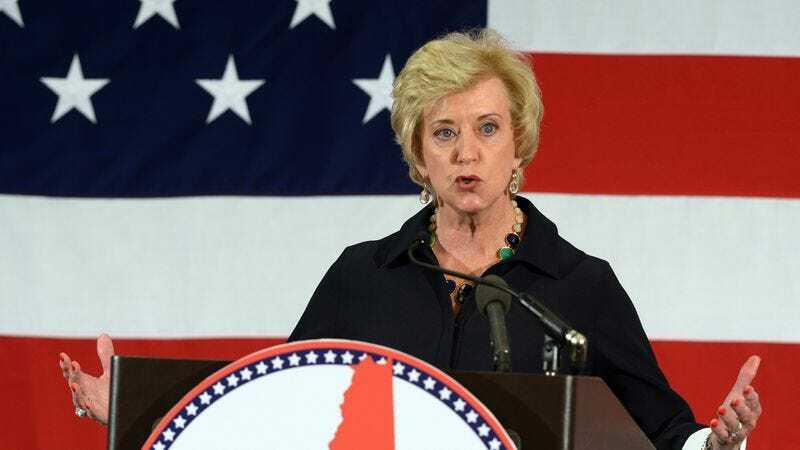 Entertainment Weekly reports that Donald Trump has once again deployed one of his signature finishing moves, “The Weird White House Cabinet Pick,” slamming former WWE CEO Linda McMahon into the role of Administrator of the Small Business Administration. Folks will most likely know McMahon from her two failed Senate runs in Connecticut, as well as that time she ended up in a coma after feuding with her husband, Vince—or saved her daughter from wrestling Juggalo wannabe Sting—as part of the plot of their long-running, suplex heavy soap-opera. Before leaning into her political ambitions, McMahon was the head of the incredibly lucrative business side of the WWE, which she helped shepherd from local-wrestling darling into a dominant cultural force. (It was her idea, for instance, to license wrestlers as action figures, easily one of the most lucrative intellectual property deals in sports entertainment history.) She also headed up a number of the company’s more altruistic efforts, like the education-focused Get R.E.A.L. program. As head of Small Business Administration—which President Obama elevated to a cabinet-level department a few years ago—McMahon will oversee programs that support entrepreneurs and small businesses. She’ll serve alongside other Trump picks like former rival Ben Carson, Suicide Squad producer Steven Mnuchin, and racist supervillain Steve Bannon, suggesting that, when this whole ”president” thing inevitably blows up in everybody’s faces, the Trump Cabinet will at least have the makings of a pretty good wrestling movie to fall back on.